Georgia Democratic Gubernatorial candidate Stacey Abrams takes the stage to declare victory in the primary during an election night event on May 22, 2018 in Atlanta, Georgia. 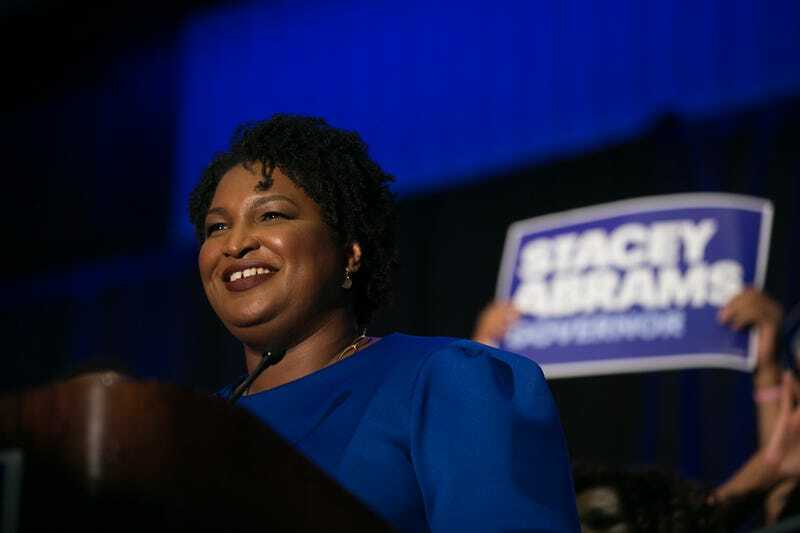 If elected, Abrams would become the first African American female governor in the nation. In 1992, when Stacey Abrams was in college, she participated in a protest where there was a burning of a Georgia state flag that had been redesigned in 1956 specifically to incorporate the Confederate battle flag emblem in it, in a clear attempt to make a statement against the burgeoning Civil Rights Movement. That history is clear, even as many white Southerners try to deny that truth. I was a college student in nearby North Carolina at the time. I wish I had known about that protest then—because I would have joined Abrams and the other protesters. At least I hope I would have had half the resolve they clearly had. That’s why Abrams should not apologize for participating in that protest and should not pretend she regrets what happened. If Abrams is half the woman her supporters say she is, I know she has no regrets, because she knows it was the right thing to do. That a 1992 burning of a flag that prominently displayed the Confederate emblem is seen by some as a potential political liability—and was unearthed just a day before an important debate—underscores the dilemma black people in Southern states have long faced. If we resist attempts by others to further embed white supremacy in the public domain, we are called “too extreme” for the states where we grew up, and where our ancestors sweat and bled on former plantations. If we go quietly into the night and say nothing, our white neighbors take it as a sign that we agree with what they are doing. They want us to feel guilty for standing up to racism and discrimination; want us to feel bad when we declare that we are Southerners, too; that our views—our heritage—also matter, not just those of white men and women who believe in myths about happy slaves and “outside agitators.” That reality has not been a prominent feature in a seemingly endless stream of sympathetic stories since 2016 by the national media about the plight of poor and middle-class supporters of President Donald Trump. Either they don’t know or don’t care that there are people of color in Trumpland, and that our voices and lives matter, too. What the national media has been doing to people of color in Southern states the past two years—mostly ignoring us while convincing the country that the “economic anxiety” of white Trump voters here should be prioritized above all else, even though there is little evidence for “economic anxiety”—white Southerners have been doing to us for decades. If you live here long enough (I live in Myrtle Beach, S.C.), you get a clear sense of how this works. Racists and racist-sympathizers take unambiguous steps to declare the South the sole domain of white men and women. When black people cry foul, many of our white friends and neighbors—and fellow church members—tell us—not the racists—to pipe down. They blame us for the resulting unrest, not the racism we are speaking up against. They care more about maintaining a peaceful calm built upon injustice than they care about the fight for equality, especially if that fight is noisy and messy. I hope Abrams does not take the bait. I hope she does not stop being the strong voice she has long been, the voice that has propelled her into a tight race and on the verge of possibly becoming the first black woman to be governor of any state in the country. She’s not too extreme for Georgia—the Confederate flag is. She wasn’t too extreme in 1992. And she isn’t now. I live in a state in which the Confederate flag flew at our State House for more than a half-century and only came down because nine black people were slaughtered in a historically black church by a young white supremacist. Abrams’ protest was the better way to affect change. Bailey is a Harvard University Nieman Fellow and author of the book, "My Brother Moochie: Reclaiming Dignity in the Face of Crime, Poverty and Racism in the American South." He's a husband and father.